Ten months after the iPhone 4 was announced, Apple is still reassuring us that the white model is on its way-possibly. After Bloomberg reported the white iPhone 4 should be on sale by the end of the month, Apple apparently reassured The Wall Street Journal that it's coming this spring. But after ten months on sale, the iPhone 4 is reaching the end of the product cycle -- so is there any point in having a white one now? We still don't know what's holding up the white iPhone 4. Rumor has it the delay is due to Apple having trouble manufacturing white iPhone that don't leak light from the edges of their glass cases. Others say it's because the white paint causes transparency on the back panel, resulting in washed-out photos when using the flash. Nevertheless, Apple is mum on what's causing the delay. 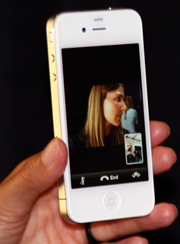 So where is the white iPhone 4 Steve Jobs held in his hand when introducing the new model last June? Well, Apple didn't tackle the delay graciously, either: initially the phone was expected in July 2010; then, in the second half of July, news broke that the white iPhone 4 was delayed again, with a release slated for later in the year; only to get delayed again until spring 2011. Apple even went through lengths to remove all traces and imagery of the white iPhone 4 from its website. Not classy. If Apple keeps to the historical iPhone release schedule, a new iPhone 5 should be arriving in June (some say it's not happening until September, or even next year). So if the white iPhone 4 arrives at the end of this month, there will be just over a month between the release of the white, older model and the introduction of a brand-new iPhone. If this proves to be true, it makes more sense for Apple to release a new iPhone 5 in both black and white from launch day (like with the iPad 2) and send this whole white iPhone 4 fiasco to the annals of tech history.